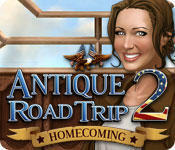 In Antique Road Trip 2: Homecoming, antique shop owners James and Grace Anderson take turns going around the USA to collect antiques. They had planned to go on a family vacation, but Grace's parents ask for their help in filling up an antique shop they bought from a previous owner. The game takes the player to Montana, Wisconsin, Mississippi and Louisiana, all rich with American history. It is a mixed puzzle game, featuring mainly hidden object scenes. It features many stages of gameplay, instead of chapters that are generally found in traditional adventure games.